Dakar conclusion: I’ve just arrived back in Cordoba, Argentina for a couple of days of rest and a Malbec fueled recovery, before flying to Santiago on Monday afternoon, then overnight to Dallas and then on to Phoenix on Tuesday morning. It has been an amazing 13 days! The trip was difficult but exceptionally rewarding. I came into this knowing little about the Dakar race and have come out amazed at the skill, conditioning and nerve of the riders and drivers who compete – they are true athletes. Think Ironman competition, which is a 2.4-mile swim, a 112-mile bike ride followed by a 26.2 mile marathon, all without a break. Now, do it every day for 13 days, often surviving on 4-5 hours of sleep per night, sometimes less, and you have the Dakar Rally. Rear motorcycle tires are replaced after every day, because they are shot. Fronts every other day. Roughly half of competitors finish. For most entrants, finishing is the goal. The same production company that does the Tour de France, does the Dakar. The Bivouac area, set up at the end of each days race, is a traveling city of 2,500 people. In following the Dakar race, our group frequently shared the road with those competing in the race – the motorcyclists, quads, cars and the trucks. This produced some of the most harrowing parts of this trip, as well as some of the most rewarding. The local population cheered us as we rode though towns as though we were competitors and mobbed us at gas stations asking for autographs and to have their pictures taken with us or on our bikes. Following the Dakar race, like we did, demands some fraction of the skill and stamina of those that compete. Not all in our group were up to the task, although every one gave it all they had. Each one on the team exhibited courage, stamina and the will to keep going when every part of them screamed to stop and rest. The odometer on my rented BMW 1200GS showed 4,762 kilometers in 9 riding days (we had days off in Iquique and Copiapo), for an average of 530 km/330 miles a day. Several in our group registered well over 5,000 kilometers. Our longest days were when we went over the Andes, the first time on day 2 was east to west, Tucuman to Purmamarca, and it was 456 miles. The second was coming back across the Andes on Day 10 from Copiapo to Chilecito. 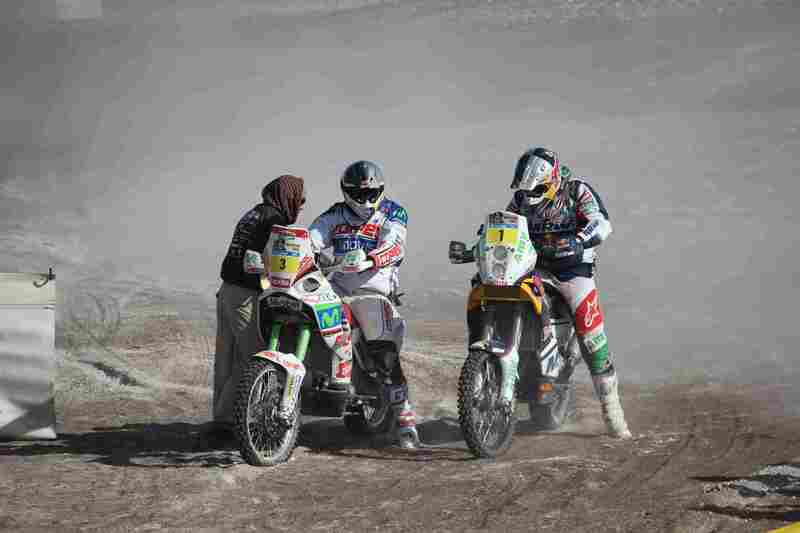 Videos that will provide a flavor for the roads can be found on the official Dakar website. Go to the various race segments and then watch a video summary for each category of competitor – motorcycle, quad, cars or trucks. It is probably the best way to get a taste of the sort of terrain being navigated. They’ve also the benefits of half a dozen helicopters equipped with the latest and best camera technology. Jim Hyde of RawHyde Adventures pulled this trip together. His blog and some excellent photos can be found here. Will Travis and Adam Sold were the only ones in our group who managed to keep a near daily update on blogs of each day’s event. You can find Will’s blog here. You can find Adam Sold’s blog here. I encourage to take a look at them and post a comment if you have one. I don’t know what I’m more impressed with: Adam and Will’s skill in handling their motorcycles or the energy and stamina required to keep their family and friends updated on such a regular basis?